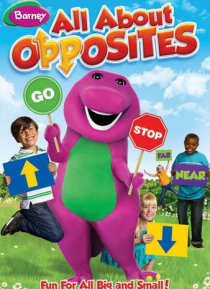 There's nonstop fun as Barney and his friends go and learn all about opposites! Everyone helps Baby Bop understand concepts like up and down, in and out, high and low. Hey Diddle Diddle, the kids see that they can be big or little but it's what's inside that counts! Then join in as Barney and his friends have a cool time on a hot day in a pretend winter-summer wonderland learning about hot and col… d! There's always Tee-riffic teaching and fun when big dinos and small friends are around!